Tibetan chrysanthemum helps reduce the appearance of puffiness. Mulberry leaves help minimize the appearance of dark circles. 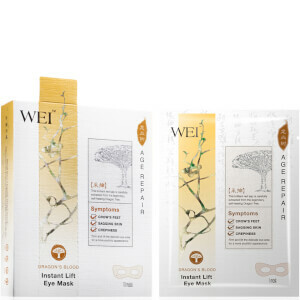 Antioxidant soybean extract helps protect the delicate eye area from free radical damage. Use 1-2 times per week or as often as needed. Smooth pads over closed eyes. Massage any remaining herbal extract around the eye area. Do not wash off. Follow with eye cream. Aqua\Water, Butylene Glycol, Chrysanthemum Sinense (Chrysanthemum) Flower Extract, Glycine Soja (Soybean) Seed Extract, Mentha Piperita (Peppermint) Leaf Extract, Camellia Sinensis (Green Tea) Leaf Extract, Zostera Marina (Seaweed) Extract, Morus Alba (Mulberry) Leaf Extract, DMDM Hydantoin, Disodium EDTA, Sodium Dehydroacetate.